Tofu, that strange spongy white block found at nearly any grocery store or produce stand in America. What exactly is it? We hear stories told that it’s and ingredient for the “vegans and vegetarians.” Yes, that would be true. We also hear stories that it has “no flavor and an odd texture.” Yes, that would also be true. It’s one of those ingredients that precipitates the “ick” factor. Yes, that certainly would be true in my case. So of course you are thinking: Then why bother? 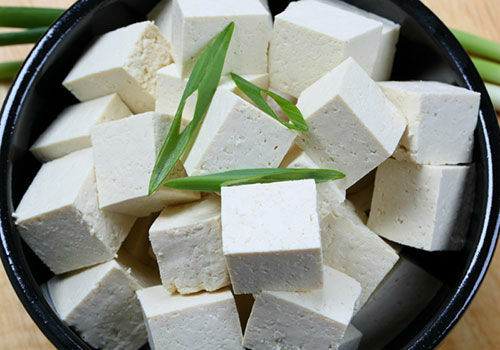 Let’s talk tofu first: There are many health benefits from come from eating tofu. It’s high in protein, calcium and vitamin E, helps lower bad cholesterol and helps fights the symptoms of menopause. Gram for gram you do have to eat a whole lot more tofu to equal that of red meat, however, you are lowering your risk of heart disease and cholesterol by doing so. Our vegan and vegetarian friends know this, of course, and use other great ingredients to balance it all out. There is a lot of great information on the web to that end. Tofu ranges in various texture from soft to firm and comes packed in water. It should have essentially no smell at all and be bright white in color. It can be kept for some time in the fridge, but the water should be changed daily, unless in a sealed package. 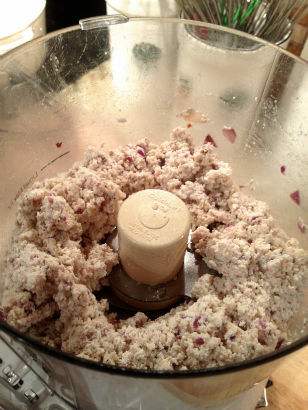 Tofu can be used as is, tossed in shakes or blended into a dip. Keep in mind it essentially has no flavor, so you have to add seasoning. 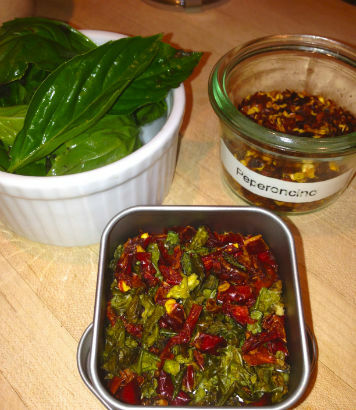 Marinades and spices are a good thing, and not even needed for a long time. Tofu is like a sponge and will soak up all that goodness quickly. 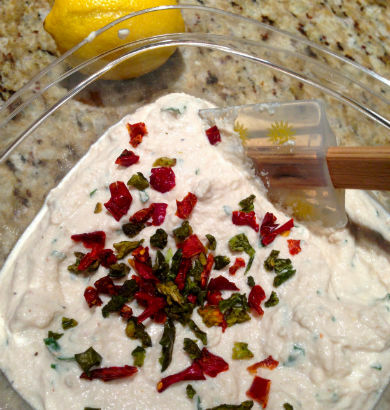 This sauce is pretty simple to make. 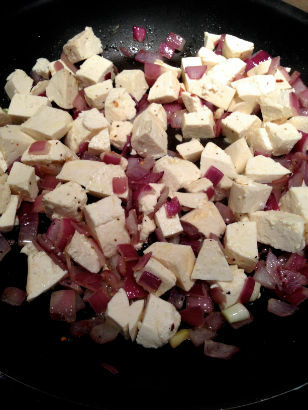 I sautéed a little red onion and garlic first, then tossed in the tofu and sautéed that too. Then broke it up a little before the real puree. I’ve been hanging on to an interesting spice blend from Spice Revolution that I got from Linsday at the Pleasantville Farmers Market a few weeks ago. It’s a blend of dehydrated red and green bell pepper. It adds a nice zing, without extra heat. To finish: a little lemon zest to brighten it all up. Click this link: to see my Tofu Pasta Sauce. 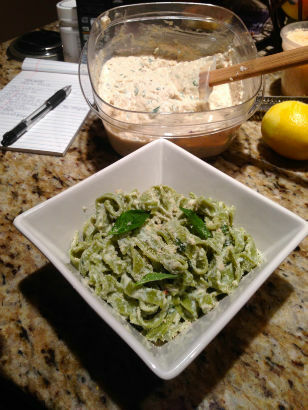 I used it with spinach pasta, which looked really gorgeous, but you can use it with plain pasta as well. Perhaps under some beautifully grilled vegetables or fish. My advice: give tofu another look, the next time you are at the store .. I think you will be pleasantly surprised at how versatile, and easy to cook with, it is. 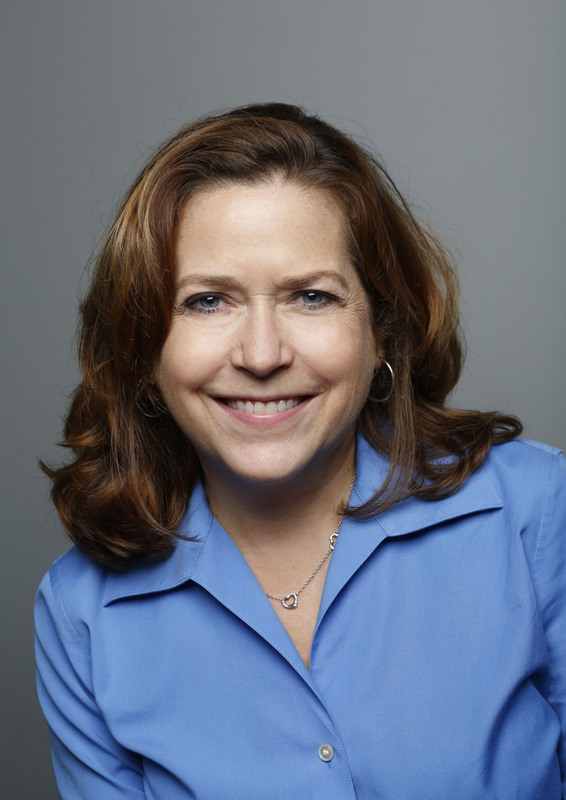 Tomorrow, check out Jodie’s column for even more on this great healthy ingredient!